Lists only count sometimes. Went to Florida for our "Spring Fling", a 948 mile journey but well worth it. Got to the range there and started unpacking and I'm looking at my rifle and something just didn't seem right. Unpacked the shotguns (mine and my wife's) still looking at my rifle thinking something just isn't right. Then I unpacked her rifle and then I'm standing there staring at mine thinking "Damn, the hole in the end of my rifle seems too dang big, what in tarnation is going on here... OH, Expletive Deleted! I manage to grabbed the wrong rifle, my 38/40 instead of the .38/357. Shared with my wife (Thank You Darlin') for the first three days of shooting, and she brought mine back with her on the plane for the match the following weekend. No question, my own dang fault, but I did check that it was my '73 and not my '92, just didn't think to check the caliber. Added another checkbox to the list. Highest "Mortality" parts I can think of are the bullets. Every one I put in my '73, comes out empty! I agree completely, wish it could be at the PA State match in May, but life is a bit complicated these days. We generally need to plan our multiday Cowboy matches a year in advance to make them possible, and sometimes even that is not enough. With the Match Director duties for the Mason Dixon Stampede passing to the very capable hands of Dutch Coroner, I am hoping that I can possibly get caught up on life's demands enough this year to have some additional "unallocated" time next year. Good luck at the match, enjoy PA, and wave when you drive through Maryland. For those of you like us, who live through the cold, dark, winter months in the northern (or Yankee ) part of the country, taking a break in the middle of winter to travel to the warmer climate of Florida to escape winters onslaught is downright fantastic, but how about adding in three matches during a single 11 day stretch? Well, doing just that has become an annual tradition for my wife and I, and one that you should definitely put on your calendar for 2020. It all started for us back in January 2007 when, prompted by my good pard Chuckaroo, my wife and I traveled to Florida for a winter Cowboy Break to The Last Stand back when it was hosted by the Weewahootee Vigilance Committee at the Central Florida Rifle & Pistol club. We continued that tradition through The "Last" Last Stand in 2013 when the Florida State Championship was relocated to St. Augustine, FL. We returned to attend the Florida State Championship match, now renamed The Siege at St. Augustine, and hosted by the Ghost Town Gunslingers, in January 2014 and that is where we first heard about the Florida State Black Powder Championship. 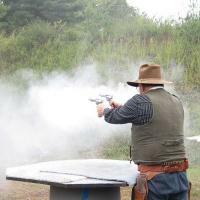 A Dark Day on the Santa Fe, hosted by the Fort White Gun Club in Fort White, Florida and run by Confederate Colt, is a match designed to celebrate those of us who like to try and hit our targets through billowing clouds of BP smoke and we immediately wanted to attend. Sadly, we were unable to adjust our personal schedules to attend that match, but we immediately put the Dark Day on the Santa Fe on our 2015 match schedule. We returned to the Siege in 2015, went back home for a few months of snow and ice, and returned to Florida in March for a Dark Day, and what an awesome time we had! Good folks, great stages, and warm, sunny skies. We could hardly wait for 2016 when we repeated the journey, and again had an absolutely fantastic time. We where already making plans for 2017 when we learned that the Ghost Town Gunslingers had decided that 2016 was to be the last year for the Siege and they would not be holding the match in 2017. Great sadness ensued. Then, in what can only be called a "Flash Of Marketing Genius!" , Confederate Colt shifted the date for the 2017 Dark Day on the Santa Fe match, the South East Territorial Black Powder Championship since 2016, so that it was the weekend just before the Ides of March, hosted by the Lake County Pistoleeros! I first learned of the Ides of March match from an article in the long gone, but greatly missed, newspaper version of the Cowboy Chronicle. I had recently read that article, just happened to be in Florida in March 2007, near the club on one of the two match days, so I made the detour to check out their range. It was definitely worth the trip, and the match had been on my "To-Shoot" list since then. So now in 2017, ten years later, I finally got my chance. I could make a single 10 day trip to Florida, in the winter, and attend two BIG matches, and to top it off for 2017 the Ides of March would also be the Florida State Championship! What more could anyone possibly want? Well, how about expanding Dark Day on the Santa Fe into a 2-Day, 10 Stage Match, and making it the Inter-National Black Powder Championship? That is exactly what Confederate Colt did for the 2018 Dark Day on the Santa Fe! So now that same 10 day trip got you 4-Days of Shooting plus a side match day, in Florida, In The Winter, where there is no snow or ice or cold! It was like a dream come true. "But" (just like in the old Ronco TV commercials) "Wait, There's More!" Recognizing the absence of the South East Territorial Black Powder Championship from the line up, in 2019 Confederate Colt added yet another shooting day to the lineup, Darkness Falls, a 6 stage match held the Day Before Dark Day on the Santa Fe! So now, there are 3 shooting days, then a 5 day break, followed by side match day at the Ides of March and then the 2 Day Ides of March match. 6 shooting Days over an 11 day period, in FLORIDA, in the WINTER, where it's WARM and SUNNY! What A Country! Now, for those of you who don't experience the same feelings of joy shooting BP that those of us on Dark Side experience, both of the BP matches, Darkness Falls and Dark Day on the Santa Fe, offer a smokeless category just for you. While I have no doubt that if asked, one of your BP Pards would be happy to help you out, you can still enjoy these matches using the new fangled smokeless stuff, but that stuff is just a passing fad. Besides, you should really clean your guns at least once a year anyway, so let this be your excuse! Finally, for those of you like us, who need to plan your calendar a year in advance, make sure to leave a gap in your schedule in March of next year and plan your trip to enjoy the Fantastic Florida Spring Fling! My wife and I will be there (hopefully that won't dissuade you from going ) as well as a lot of other great folks. Over the years, we have had the pleasure of shooting with Santa Fe River Stan, Delta Glen, Rocky Creek Shooter, Cassalong Hopidy, Chance Ramsey, T-Bone Dooley, Ol' #4, and so many others from all over the country, it's impossible to name them all. I know I am already counting the days until Darkness Falls..... Darkness Falls - March 12, 2020 Dark Day on the Santa Fe - March 13&14, 2020 Ides Of March - March 20, 2020 (Side Matches) (Still showing 2019 information as of 04/02/19) Ides Of March - March 21&22, 2020 (Still showing 2019 information as of 04/02/19) Hope to see you all next year! Dogmeat Dad & Lil Feathers P.S. I would be remiss if I didn't offer a HUGE THANK YOU to all of those who work so hard to put on these matches, much of it behind the scenes where their efforts go unseen. Please forgive me, because I am 100% sure I am going to miss more than just a few folks, but here goes... Confederate Colt - For making this happen! Jane Deere - For being Colt's right hand woman! Greta Dee - For Everything, especially the HUGS! Brucester Diamond - Gone but never forgotten! Smart* - For his "Enlightenment" Rocky Creek Shooter - Patience of a Saint & Posse Leader Extraordinaire! Yadkin Hawks - The Man Who Is Everywhere, Doing Everything! Delta Glenn - Hardest Working Cowboy I've Ever Met! Santa Fe River Stan - The Man, The Legend, Mr. Speeeeeed Demonnnnn! And to all of those who put in their time for Registration, Setup, Teardown, Building Props, and Dragging Steel.... THANK YOU, ONE AND ALL, & SEE YOU NEXT YEAR! The Latest Who's Coming List for 31 March 2019 has been posted. Inching our way up and now at 34 Shooters, but still only from 8 different States. Come On Ohio, cause I'm about to give up on New Jersey! Who's Coming List Don't for get that we have approximately 50 camp sites with Water and Power (mostly 30A but a couple of 50A) and with the pool open, it will be a great place to be in August. The requirement for the Chronicle Ad was for SASS Sanctioned Matches, i.e. State & Above. Club Annual are not required to be held, and the matches do not have any specific requirements for advertisement. in general, clubs put a lot more effort into their annual match in terms of better props, better stage setups, additional activities, and they usually have more shooters than their monthly matches. They typically draw shooters from farther away and, at least in my experience, provide an opportunity to experience Cowboy Action Shooting with a different flavor than what you get at your home club or clubs. It is also a chance to shoot with people you might otherwise never meet in person, only online. This year, at match in Florida, my wife and I had the opportunity to shoot with Ol' #4, T-Bone Dooley, Ellie Gant, and others from other parts of the country. Some we had met before, others for the first time. When we go to these away matches, we rarely ask to shoot with anyone but ourselves just so we get the chance to meet others. It is the best way to make new friends with folks who all share a common interest. State Championships and above are usually just a further extension of that, all the way up to Winter Range and EOT. My advise is "Don't look for a reason to go to an annual, look for an annual you want to attend, and just go. You won't be sorry!" They tend to focus the sound, so as long as you don't have close neighbors (Not Texas close i.e 15 miles away, but like under a mile) you shouldn't have issues although folks may want to upgrade their hearing protection. In addition to extending the lifespan of the walls, a wood covering helps to deaden the sound AND reduces bounce back of shotgun and bullet splatter. Great shooting with you and Ellie at Dark Day in Florida! Find a cheap hotel with HBO and go for it. Rumor is some hotels rent by the hour, but I'd be afraid to sit on anything in one of those places! Looking forward to it. In fact, the Maryland State Championship is being based on the series (well, a PG13 version of it anyway ) in recognition of the movie coming out. Been waiting a long time for this to happen, and to be honest, I had pretty much given up hope. Glad they are finally doing it. The Latest Who's Coming List for 17 March 2019 has been posted. We are now at 31 Shooters but still only from 8 different States. Where are the New Jersey Shooters, or how about Ohio, be a good warm up for GoA? I know you're out there! Who's Coming List Don't for get that we have approximately 50 camp sites with Water and Power (mostly 30A but a couple of 50A) and with the pool open, it will be a great place to be in August. I'm just impressed that he remembered the shooting sequence! BTW, the Idea of March was a great match with great stages, great folks, and near perfect weather. Can't wait for 2020!